Last week marked the 70th anniversary of the Japanese attack on Pearl Harbor. My husband's grandfather (now deceased) was an Arizona survivor, therefore, the anniversary has special meaning for our family. Five years ago we attended the 65th anniversary symposium sponsored by the Pacific Historic Parks and the National Park Service. The symposium, which precedes Dec. 7, offers four days of conference presentations from historians and survivors. I had the privilege then to witness several surviving Japanese pilots and U.S. servicemen meet for the first time in 65 years and make their peace with each other. At the 70th anniversary symposium this year, there were no such reconciliations, due to the declining number of veterans in attendance. However, the conference offered numerous insightful sessions featuring servicemen survivors recounting their experiences, civilian survivors and their memories, an emotional retelling of the attack on Kaneohe Bay Naval Air Station by historian Michael Wenger, and historians and a former peacetime Admiral of the Japanese Navy analyzing the enduring legacy of the attack. In addition to the dwindling number of survivors at the symposium, there was yet another sign the voices of the greatest generation are passing on -- The Pearl Harbor Survivors Association is disbanding at the end of this month. Its membership is down to about 2,700 from a high of 28,000. While attending the various commemoration events this week, I came to the realization I was witnessing a pivotal moment in history. With the passage of time not on the veterans' side, we're moving from experiencing living history -- where the veterans can share their stories in their own voice -- to written and recorded history where we all become the trustees of their stories. Over and over again the vets said that it's important their stories continue to be passed on to future generations, so their sacrifices are not forgotten and their lessons not lost for all time. From the USS Arizona, the ship that bore the brunt of the fatalities (1,177) the morning of Dec. 7, 1941, only 18 survivors remain. Seven were in good enough health to make the trip to Oahu this year (picture below). For most, it was their final pilgrimage to this hallowed ground, so meeting them was bittersweet. Their heroic war stories should be retold, but their personal stories are worth remembering as well. I heard many tales of bravery and sacrifice, but for me, it was equally fascinating to meet the men behind the stories and get a glimpse into who they are as people. Some observations from the week that I will take away are as follows. The oldest Arizona survivor is 97-year-old Joseph Langdell. He said the secret to his longevity is "to not eat whatever you want, do what your doctor tells you, and appreciate women." On this last point, Langdell is especially adept. For any woman who wanted his autograph or a photo taken with him, he would grin and say you had to pay your toll first - in the form of a kiss. Langdell's cheek was covered in lipstick on Dec. 7 (picture below). Adolph Kuhn, a Navy man stationed on Ford Island at the time of the attack, regaled the standing room only symposium crowd with his humorous take on how he survived one near Japanese miss after another -- 19 in all. His never-ending Forrest Gump-like account (complete with guardian angels) should be made into a movie and went on for so long that he had to be cut off by the moderator. He reminded me, "You can read how the story ends in my book." Purchase his book on Amazon. The keynote address at the USS Arizona Reunion dinner was given by Patricia Fuqua Nagle, whose father was Samuel G. Fuqua, a Rear Admiral in the U.S. Navy, stationed on the Arizona. He survived the attack, and went on to tell his daughter that when he first saw the Japanese planes overhead, his first thought was, "Oh hell, there goes Christmas leave." 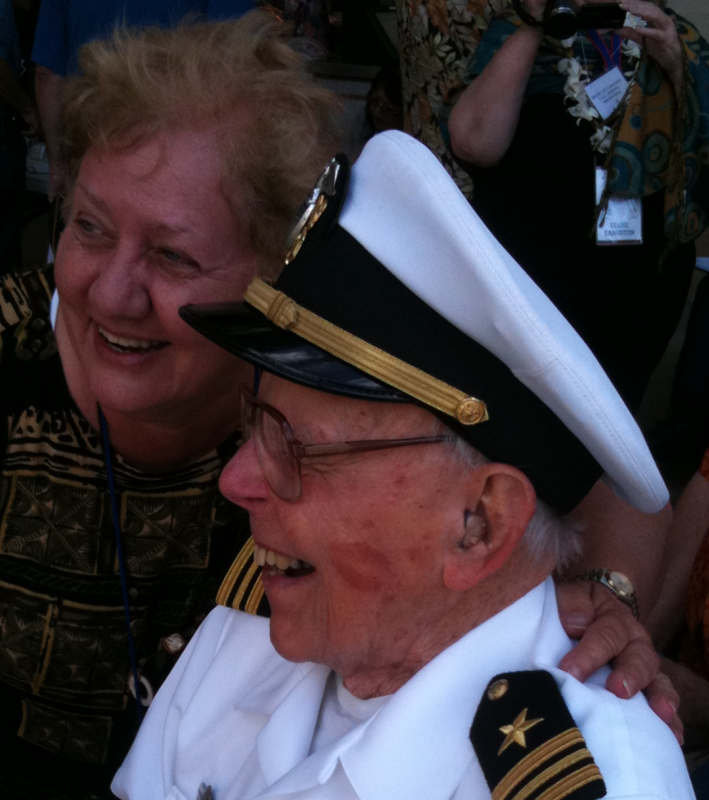 One of three remaining USS San Francisco survivors, Mal Middlesworth, and his wife, Jojean, have been married 67 years. They were high school sweethearts in Illinois and married after the war. Jack Hammett, a Pearl Harbor Naval Hospital survivor, just lost his wife in March after 71 years of marriage. He said she was his best friend, and he became emotional recounting her decline from Alzheimer's. Lee Soucy, a USS Utah survivor, who passed away last year, was married for 65 years. A portion of his ashes were interred last week with his shipmates on the Utah, and the rest of his ashes are laid to rest beside his wife in Texas. There are lessons to be learned from these veterans about the meaning of commitment and how they apply it in their every day lives. As I heard stories of more and more marriages that lasted well over 60 years, it put in perspective the ridiculousness of the media's obsession with a recent 71 day "celebrity" marriage. A crowd of about 5,000 turned out when 3,000 had been expected at Pearl Harbor on Dec. 7. Every time the survivors were asked to stand as able, the raucous crowd cheered. It was unforgettable to see how the vets were touched by this response. Most of the commemoration is available on C-SPAN. In a poignant moment at the end of the ceremony, all Pearl Harbor survivors -- military and civilian -- and their families -- were asked to walk through a "Walk of Honor," a Navy honor guard line. Some vets walked on their own, while others used canes, walkers, wheelchairs, or the helping hand of a proud son or daughter or grandchild. It was a joyous moment to behold the survivors making their march into history. For those few minutes, each was a celebrity as cameras clicked and both civilian and military alike stood in salute, or outstretched their arms to shake hands with the vets and thank them one final time for their service. Following the ceremony, the survivors spent the day meeting with visitors at the Pearl Harbor Visitor Center, sharing stories and signing autographs. For those of us fortunate enough to experience this week of living history, it was difficult to leave. We take with us the knowledge that the day is near when we return and all of the survivors will be gone.